Explore Sardinia's remote Costa Verde by bike. Along the way you will see breath-taking views of the crystal clear Sardinian sea. Discover ancient abandoned mines and roman ruins near Pula. End with a stunning cycle along the 'Costa del Sud' to vibrant Cagliari. Today you will arrive in Arbus and check into the agriturismo, your base for two nights located a few kilometres outside of Arbus town. Arbus is well known locally for the production of the l'Arburese knife and there is a museum in town dedicated to it for those interested. Alternatively you may just choose to relax at the agriturismo. The first ride starts with a panoramic road through a cork oak forest to Arbus, then pedal up to the old mining village of Montevecchio where you can visit the abandoned mine site (not included). There are four different tours and take about 45 minutes each. After the visit you continue cycling along a wild and scenic Mediterranean 'macchia' route, finally descending to the sea. Here a short deviation takes you to one of the most extended desert area of Europe - Piscinas beach. After a rest stop you cycle uphill through the almost abandoned mining village of Ingurtosu on your route back to Arbus. Total cycling distance today is approximately 53 kilometres (1070 metres total accumulated ascent and descent). Today's ride starts with a long winding downhill to Portixeddu, one of the favourite spots for local surfers. Here you can take a break for some good coffee before starting the climb to Buggerru, where a system of tunnels were used to transfer minerals from the mines to the port. Further on you can enjoy great views of the Pan di Zucchero (Sugar Loaf) cliff and the Masua mines. The ride ends in the village of Nebida where you spend the night. Total cycling distance today is approximately 40 kilometres (758 metres total accumulated ascent and 1047 metres descent). Todays ride starts with a gentle 25 km to the port of Portovesme, where you take the ferry to the Island of San Pietro. Upon docking at Carloforte harbour you may soon start noticing the different accent the Carlofortini have - in fact they have Genoese roots and speak a different dialect from the rest of the Sardinians. It is here in the last week of May that Italy's last remaining 'tonnara' operates as a system of nets is used to catch the Tuna. They also have a culinary festival at the same time. After a short visit take another ferry, this time to Calasetta, on Sant'Antioco Island - home to some excellent wines (from the local Carignano del Sulcis vine). The Sulcis region is known for the Carignano vine that can live with very little rainfall and is stunted by strong winds to no more than a foot high. Many local families still have a little vineyard to produce it and after a sip you know why they still make it! The last section of the ride is around 12km on the flat to Sant' Antioco town. You can choose to kick back and relax today or take a cycle ride around the island. Our suggested route makes its way around the island, with stops at various inlets for a break or picnic. Other options include taking a fishing boat excursion or just to relax on the beach. Total cycling distance today is approximately 40 kilometres (380 metres total accumulated ascent and 380 metres descent) (optional). This morning you ride back to the main island of Sardinia. Leaving S. Antioco there is a section of about 2km where you have to ride on the busier main road before turning onto quieter secondary roads. The first stop on today's ride is at the village of Tratalias, with its Romanesque church dedicated to Santa Maria di Montserrat. After the village of Santadi, you pass by the stunning caves of Zuddas where you have the option to visit. Finally a ride along a quiet road leads you to Teulada, your final destination for today, famous for terracotta pipes and highly refined embroidery. The final ride is a must for cyclists! The Costa del Sud is an incessant repetition of ups and downs with breath-taking views over the coast and the sea, with occasional watchtowers and beautiful inlets. There are several places to stop and swim in the crystal clear water. The final stop is in the lively town of Pula from where you catch the local bus to Cagliari, which takes about one hour. With such little time in this city you may choose to extend your stay beyond tonight. General: Pack essentially for hot or mild weather depending on the time of the year plus some warmer clothes for colder nights. You may want to pack a swimsuit and towel, depending on the time of year, as there will be some opportunities to swim. If you are not bringing cycle shoes then try to bring stiff-soled shoes as these are better for cycling - transmitting your energy into the pedals more efficiently. This becomes more relevant and recommended the more demanding the grade and distances to cover. We do not recommend roadbike cycling shoes with protruding cleats on this trip because part of the first ride is on a gravel road and sand. MTB flat shoes are fine. Comfortable shoes, trainers, sandals or flip flops are useful when not on the bike. We recommend flights into Cagliari airport which are served by both budget (including Ryaniar and Eurowings) and non-budget airlines (including British Airways) from multiple airports in the UK. 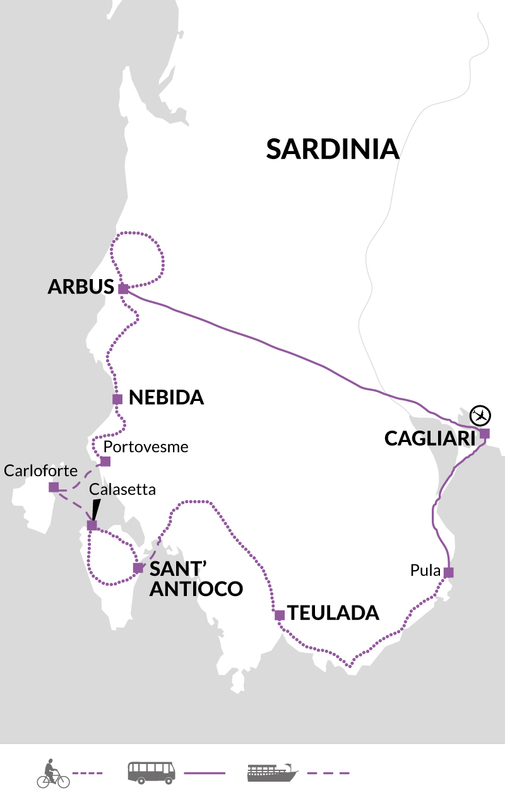 At the start of your trip you can fly into Cagliari airport. There are trains going from Cagliari Elmas Airport to the train station of San Gavino . The journey takes approximately 50 minutes and costs around 4 Euros. From the train station of San Gavino a private transfer takes you to your accommodation in Arbus. At the end of your trip you can fly back from Cagliari airport. From Cagliari you can take a train to Cagliari Elmas Airport Train Station. The journey takes approximately 7 minutes and costs around 1.50 Euros. On this journey you cycle 222 km over five days (an average of 44 km per day) with further optional rides available. The rides are generally on quiet tarmac roads and most of them are through hilly terrain with the steepest and most challenging climbs on days 2 and 3. We have graded the route as moderate. Your included bike is a 30 gear custom-built hybrid bike and will be the correct frame size for your height. A rear pannier is included and there is the facility to fit your own pedals or saddle if you wish to bring them. All you need to bring is your own helmet. Fri 15 Mar 2019 - Mon 27 May 2019 Your trip can depart anytime between the above dates. Contact us for triple room requests and solo traveller prices. Tue 28 May 2019 - Tue 25 Jun 2019 Your trip can depart anytime between the above dates. Contact us for triple room requests and solo traveller prices. 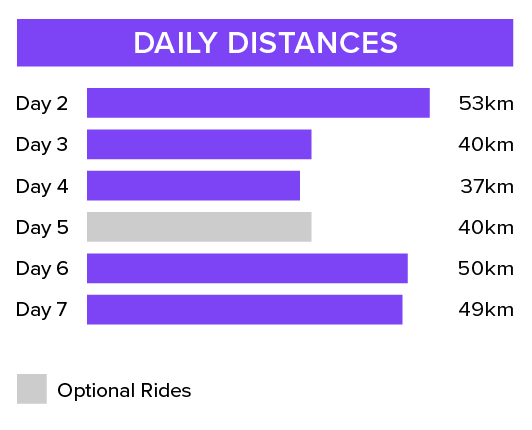 Wed 26 Jun 2019 - Thu 25 Jul 2019 Your trip can depart anytime between the above dates. Contact us for triple room requests and solo traveller prices. Tue 1 Oct 2019 - Fri 15 Nov 2019 Your trip can depart anytime between the above dates. Contact us for triple room requests and solo traveller prices. Sun 15 Mar 2020 - Wed 27 May 2020 Your trip can depart anytime between the above dates. Contact us for triple room requests and solo traveller prices. Thu 28 May 2020 - Thu 25 Jun 2020 Your trip can depart anytime between the above dates. Contact us for triple room requests and solo traveller prices. Fri 26 Jun 2020 - Sat 25 Jul 2020 Your trip can depart anytime between the above dates. Contact us for triple room requests and solo traveller prices. Thu 1 Oct 2020 - Sun 15 Nov 2020 Your trip can depart anytime between the above dates. Contact us for triple room requests and solo traveller prices.